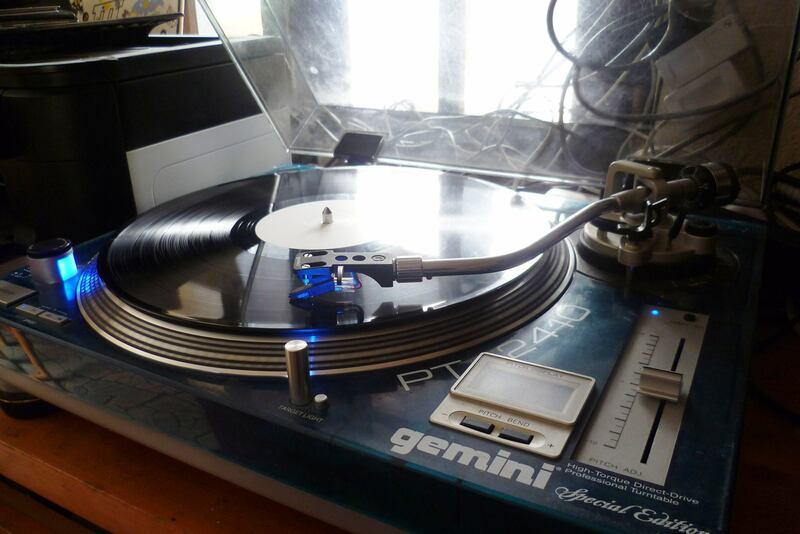 Diamond Jack and the Queen of Pain – a white label having its first spin today! Today is my birthday and in my letterbox there was something rather special. I didn’t realise that you can actually get a 12″ record into a standard size French post box, but you can. This was the test pressing of the Diamond Jack and The Queen of Pain re-issue by Kevin Ayers. There are only four of these in existence so I felt very honoured to have been sent one by Rob Caiger who is the re-issue producer of the record. Last week Rob sent me the ‘flat’ .wav files that came straight from the masters, I burnt them to a CDR and had a listen. I wasn’t massively impressed to be honest, it was like no other Kevin Ayers album I had ever heard…a bit, errm, well 1983! Anyway it was enough for me to hear, so I could write a few paragraphs and send them to Rob. Hopefully my thoughts will end up on the sleeve notes in the final artwork. It probably didn’t help that I didn’t put the tracks on the CD in the correct order. I really believe that you should always listen to the tracks of an album in the order they are meant to be in. I can’t be doing with all that randomizing and shuffling, it’s just an insult to the artist when they have probably agonized over the running order of an album. This was always one problem I always had with CDs – my favourite track on most of my favourite albums always tended to be the first track on side two, so where is that on a CD? The usual pattern with vinyl is that side one blows your mind and leaves you wanting more, so you wander over to the turntable and put on side two which is always a surprise and sets the scene for your journey across side two. As the record was a white label we didn’t know which was side one or two, so we accidently put on side two first. At the moment this is my favourite track – odd that isn’t it? ‘Stepping Out’ you will probably know from the 1986 album ‘As Close As You Think’ and maybe even the single taken from that album. It was weird, both Susan and I know the album ‘As Close As You Think’ very well and we had heard the Diamond Jack version last week, but really we didn’t recognise it straightaway. Rob has done a great job with the remastering of this album. I think he’s fiddled with the EQ a bit maybe done some stuff with aural exciters and stuff like that – it’s subtle but it has made a difference. It is also worth noting that the original .wavs didn’t really have proper ends to them, but now they do. The best thing about this album though is Kevin’s voice. Playing a brand new bit of vinyl in our living room and terrace was lovely, I know us old farts bang on about vinyl, but it really does sound ace and Kevin’s voice sounds spot on. I know this album won’t be everyone’s cup of tea, but it’s here – it’s certainly an unusual album, but I’m looking forward to hearing it again. If it wasn’t so late and my daughters weren’t in bed I’d put it on right now. I would like to add to Rick`s nice comment a little personal note. Last week I was in Madrid, exploring so to say Kevin`s, Ollie`s and Diamond Jack`s ghost, for two days: first seeking the recording studio, then trying to contact people involved. In order to better understand Diamond Jack, it might help taking into account that the city where it was rehearsed and recorded, was a very effervescent city in 1983, good for Kevin, a city in transformation. Madrid was drifting away from Franco`s dictatorship in a frenzy of desire to live, a thirst of sensations and experience. I remember that city, which has now disappeared, or remains only as a ghost. When I crossed at 7:30 in the morning Plaza de Santa Ana, going to my job, there were already plenty of guys selling you pot, very good Moroccan hashish, in the corner of the National Theater, and the meetings, friendships, relationships, conversations, clubs and night clubbing of those days were impregnated in a sort of hashish quality. It was the Madrid of the early Pedro Almodovar. I remember to have read once a note by Zanna, going in a taxi with Ollie Hallsall, which captured that very special atmosphere. I think you should take this atmosphere into consideration, try to imagine, try to make a travel in time, when listening to the record, and maybe you will discover more about the elusiveness of these songs. I like very much Diamond Jack and Falling Up, they translate a shadowy and meaninful part of my youth. During my two days in Madrid last week, I failed in many things: invitations to speak with musicians involved in the project were not replied, I couldn`t find any copy of “Percusión”, the movie where Kevin plays the role of a comicbook author (whose main character could be, perhaps, a certain Diamond Jack), but I found a last and remaining copy of the vinyl in a charming second-hand vinyl shop called “La Gramola”. It was a triumphant moment: to see the girl extracting Diamond Jack, crop 1983, directly from an old box. It was probably the last copy existing in shops around the world. And that makes still more eventful the reissue of the album, afresh again with this effort. I hope you enjoy it. I didn’t buy it because I already found one years ago in a fair of old vinyls. The one I’ve never seen is As close as you think. I don’t know if it can be easily found in Holland where it was originally released if I remember well. Percusión is not on DVD and I’ve never seen it on the Spanish TV. Previous post: Something In Between?